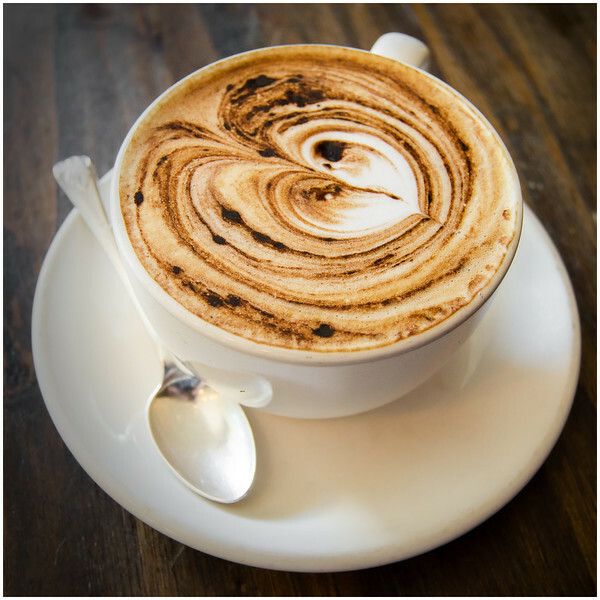 There are a few cafes in Hobart that seem to consistently generate interest. Tricycle Cafe, Jackman & McRoss, Machine Laundry Cafe etc…Whether it’s for their menu, coffee or ambience (and hopefully a combination of all three!) they’re normally very good recommendations for a quick bite to eat or a catch up with friends. We hadn’t eaten at Pigeon Hole previously, but not for a lack of trying! Every time we had stopped by for breakfast it was always jam packed with singles, couples and families getting their weekends off to a relaxing start. So it was with great anticipation that we walked through the doors and sat down for a light meal! The size of the cafe is a little deceptive at first glance, and it would be easy to think that they only had a few tables seating three people at most in the front and side of the narrow room. Fortunately, the room opens up at the rear and there are numerous tables out the back more suitable for larger groups of four or more. There was a great ambience within the cafe, with obvious regulars drifting in and out, ordering their regular weekend kickstarters ‘to go’, or a loaf of freshly cooked bread from the numerous varieties on offer. While at the same time there were quite a few families with children in tow, reading their papers and generating a buzz at the rear of the cafe. It was pretty obvious that most, if not all, had been before and they were coming back to an old favourite. The menu was very appealing, ranging from typical breakfast fare, through to a soup of the day and a number of paninis. While not extensive, it gave enough options to satisfy most cravings, including those of the vegetarian or gluten free type! We had walked in with the expectations of breakfast, however after reading the descriptions of the paninis we very quickly changed our minds and decided to give them a go. 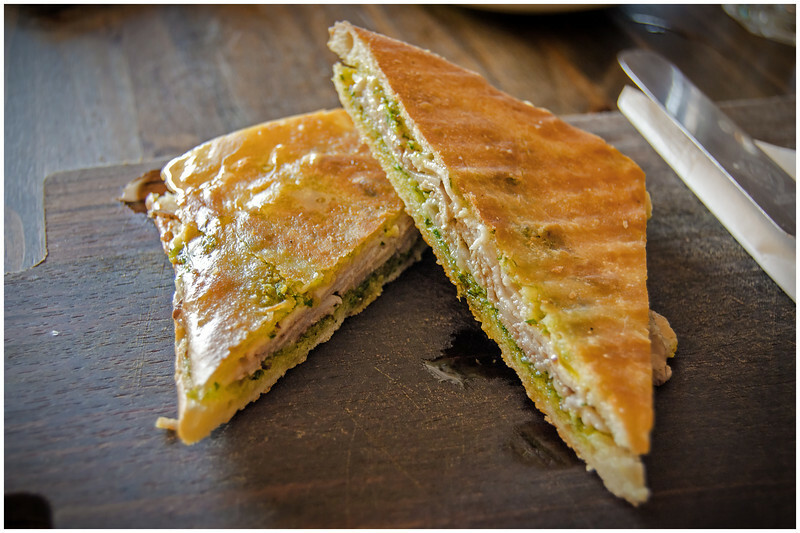 For myself it was the Porcetta Panini with Aioli and Hazelnut Gremolata ($11.50). While for Karen it was the Wagyu Brisket, Pickled Carrot and Gouda Panini ($12) and a cappuccino. Other menu items that appealed included the (very epic sounding) Eggs en Cocotte, with Jamon, Soused Onion, Leaves, Preserved Lemon and Parsley, with either Grana or Teleggio cheese ($12.90), or the popular Natural Yoghurt and Gluten Free Crunch with Strawberries and Agave ($11.90). 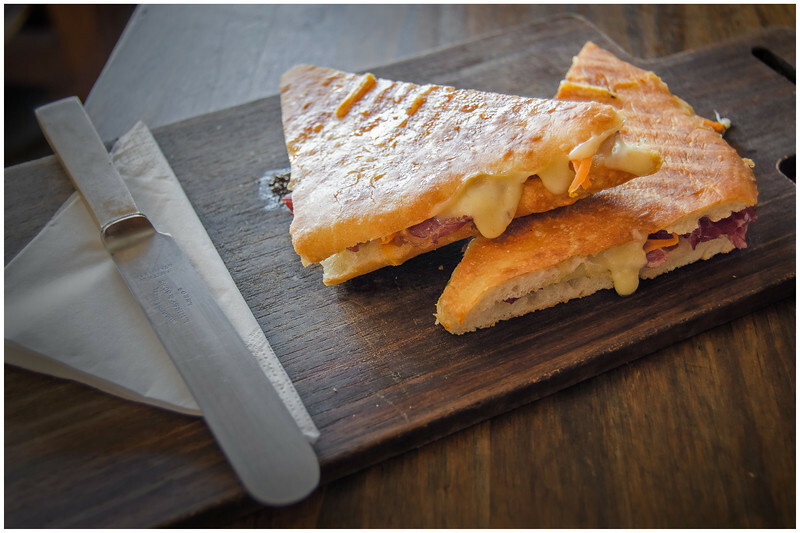 I have to say that they must have these paninis pre-made and ready to throw on the grill-press, because it would have been no more than 5-10mins between placing our order and having them served up on rustic wooden chopping boards at our table!! Points for efficiency, but it certainly cut down on time to relax/chat. I don’t know if we’re a little weird like that, but we love our food, and once it arrives almost all chit-chit ceases while we focus our attentions on the gastronomic wonders in front of us! The paninis smelt wonderful, and the fillings looked delicious, with sticky gouda cheese oozing deliciously out of the wagyu panini, and the vibrant green herbs of the gremolata in my porcetta panini catching the eye. To taste? The fillings themselves were wonderful. Fresh, interesting flavours that worked very well together; particularly the porcetta panini, which was a bit of a surprise to us both as we were expecting the wagyu panini to be the better of the two! Simple combinations, but they work effectively together on the taste buds! BUT!! Unfortunately the meal was let down quite a bit by what can only be described as extremely liberal application of oil during the toasting of the paninis. As you can see from the photos, both paninis were served in a tiny pool of oil, with a little extra on top, just for good measure! While I don’t mind oil per se, the texture and volume really did detract from what was otherwise a very good meal. In the end it was a great start to the day. While perhaps not quite reaching the heights that we expected for such a Hobart institution, it’s a cafe that we would certainly return to another day (but hopefully with a little less oil next time! ).